All Spanish cedar lined interior with humidifier included. This is a very nice product. it's not expensive, but it is elegant and has a unique and high quality appearance. it does a normal / average job of keeping my cigars at the right humidity level, especially when i tend to the humidification elements regularly. you can spend a lot more, but this does the job admirably! Burlwood 40 Count Humidor W/ Humidifier is rated 3.8 out of 5 based on 3 customer ratings. Hello, I was wondering if this came with any dividers? Thank you! 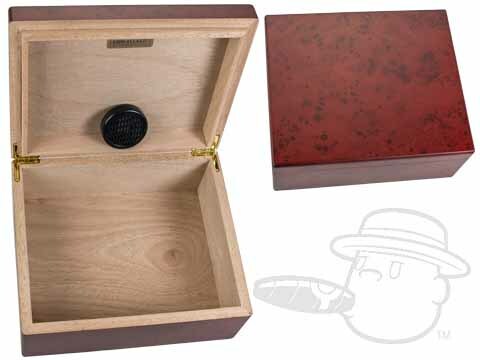 Our Burlwood 40 Count Humidor w/ Humidifier by Orleans does not have a dividier.